You can lose inches in just one hour! No joke. I lost 5 2/8” during a 60-minute Nutrient Body Sculpt treatment at Reflections Laser & Wellness Center. And I felt refreshed and revitalized. It’s like I had super foods by way of my skin. As a woman in her mid 50s who wants to feel and look healthier – and younger, of course – I was amazed and excited to discover what seems like a magic bullet. But it’s the real deal. Nutrient Body Sculpt is a revolutionary treatment containing essential ingredients that fortify and hydrate the body. Based on scientific research and clinical trials run by Dr. Kedar Prasad, one of the world’s leading experts in antioxidant science, this is the only sculpting product available today that contains micronutrients and minerals. The body sculpting method uses latex-free bandages that are stretched across targeted area of the body. 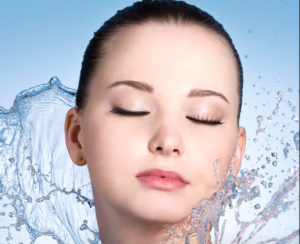 The bandages are soaked with an exclusive, high-grade solution that maximizes hydration of the skin. Jo, the tech who gave me the treatment, was very personable and knowledgeable. First she took measurements of my thighs, hips, buttocks, abdomen, chest, arms and chin. (Yes, even my chin size was reduced.) Then, she skillfully applied the wraps. While wearing the wraps, I stood on a vibrating machine designed to help the nutrients absorb and drain into the body as well as burn a few calories. After she removed the wraps, she took the measurements again. Sure enough, a total of 5 2/8” came off my body in various places. Of course, Nutrient Body Sculpt will work best long-term if you adhere to a healthy lifestyle and have repeat treatments. Other women have reported that they’ve lost all of their cellulite and kept it off. In fact, Emmy award-winning actress Loretta Swit and a number of celebri ties endorse this product. Jo also told me she had a client who said it helped her with her Fibromyalgia. The benefits are truly incredible for the time and effort you invest. This solution is designed to tighten and tone; improve body contour; lift thighs, buttocks and breasts minimizes fine lines; improve mental clarity; relieve stress and relax the body. Don’t we all want these results? Take my word for it. Book your Nutrient Body Sculpt session today. Call Reflections Laser & Wellness Center at 561-221-1462.